Valve's Source 2 engine is here! Hints a possible Xbox One release? It's been ten years since developer Valve launched its Source game engine with Counter-Strike: Source and Half-Life 2. For years there have been rumors about Valve working on their next engine, which is now confirmed. With yesterdays update for Dota 2's map editor and modding tools, there is definitely definitive proof of the engine's existence. Users of Reddit, and NeoGAF found that there is a huge redesign of Valve's Hammer map editor. The interface and performance have been overhauled, and users can now select between two map file formats, a ".vmap" file, and the the older file map format ".vmf", and all files similar to Source 1 engine are now labeled with a 2. You can find a comparison between the old and the new Hammer editor below. As of right now only Dota 2 is running and can be run on Source 2. The game loads quicker, and feels very responsive. What is interesting is that now the game is running 64-Bit instead of 32-bit, which explains why the game might be more responsive. There are also way more particles and a little bit more shadows, over all there is no real big change in how Dota looks, but the functionality of the game itself has greatly increased. So, this is amazing news right? Well, that's not all! Valve might actually be developing with Source 2 engine on Xbox One. 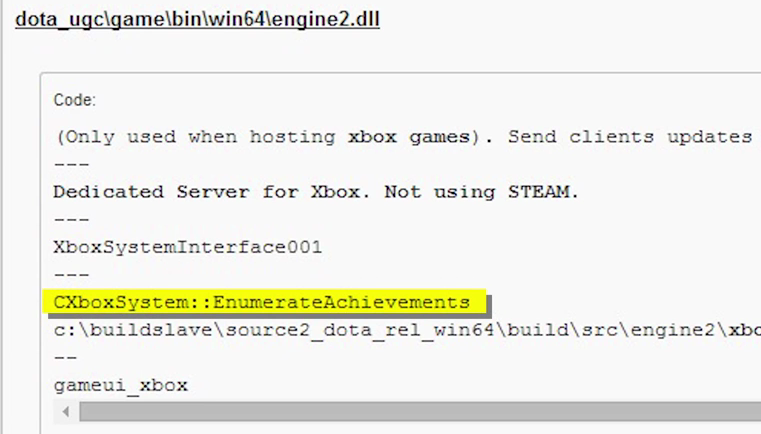 Users of quite a few forums where able to find pieces of code related to the Xbox One in the files of Source 2 engine. As of right now this doesn't mean we will see a Xbox One game, but might see something related to Xbox One soon. What's even more interesting is that in one of some of the code it mentions "Dedicated server for Xbox. Not using STEAM", so saying that, I feel like what ever is in development might actually be cross-platform, where we can play on Xbox in the living room and continue in the bedroom on PC. But it also could mean much more. Now that might not even be true and it might even be a placeholder for future development, we're just going to have to wait and see what Valve has in store for us.